I just have to say: the state of US politics right now has me in a pit of despair. I'm trying to so hard to turn down the outrage, anger, and hopelessness swirling through me (and my job requires me to pay attention to politics, so can't really ignore -- nor do I want to!) but I don't want to be complicit in what's happening by being unresponsive. I'm grateful for Unabridged Toddler, who is my sunshine and joy each day. As a result, he's got me wrapped around his finger, and as you can see, on tap for this weekend is reading every book in that pile, more than once! 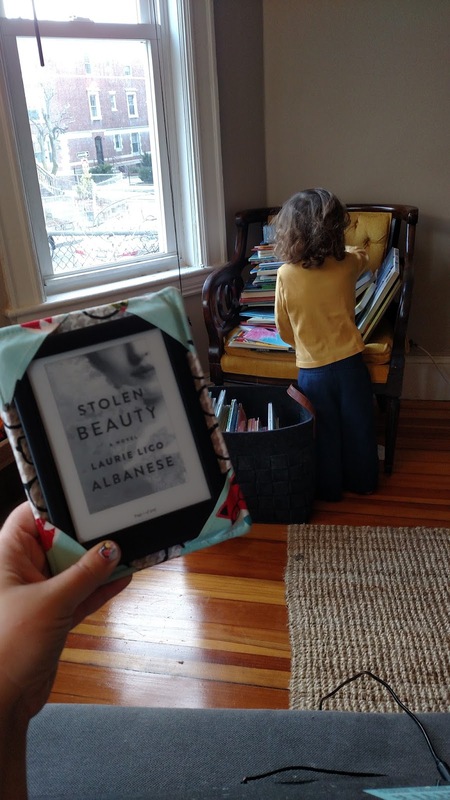 I'm also hoping to start Laurie Lico Albanese's Stolen Beauty, a historical novel about Klimt and Adele Bloch-Bauer and World War II. It's been a book I'd been soooo excited to read so can't wait to dive in. We're all in a funk because of politics too. I keep telling my husband not to read the news but he does anyway and then starts ranting. Thank heavens for your sweet little toddler! Because of a literature course I'm going to next week I'm actually re-reading 1984, sigh. Not the best time for this as I dearly want some escapism. I don't live in the US, but I do sympatize and are with you in the fear of what Trump might do to THE US and to the rest of the world. I read Parable of the Sower recently for a book group. Lots of parallels to the current political situation! I only get my news in small doses, because that's all I can take! Hope you have a great rest of the weekend! The news and politics are all I deal with at work, and boy oh boy does that make it hard not to go off in a rage or just feel depressed. The kids really are the hope and the light.